Joe Thalman was his instructor. He is listed as attaining the rank of Technical Sergeant. Joe Thalman was his Instructor at Douglas. S/N: O-802973. He became a Fighter Pilot with the Flying Tigers (16th Fighter Sq, 23rd and 51st Fighter Groups). Flew 102 missions. He flew P-40, P-51, B-25, C-47, F-86, T-28, etc. He was shot down 4 times. Post war he was with the F.B.I. until recalled for the Korean War, where he spent another 4 years. He wrote the interesting and entertaining book, Warriors Who Ride the Wind. Click here for more information and pictures. He enlisted 2 Apr 1942. Joe Thalman was his instructor. Born in Alabama approx 1922. Enlisted from Gainesville, FL. Later was possibly a pilot in New Jersey. Joe Thalman and Lloyd Sager were his Instructors. He had Basic at Greenwood arid graduated from Blytheville Army Airfield, Arkansas S/N: O-802698. Later he was in the 15th Air Force, 5th Wing, 352 Bomb Group in Italy. 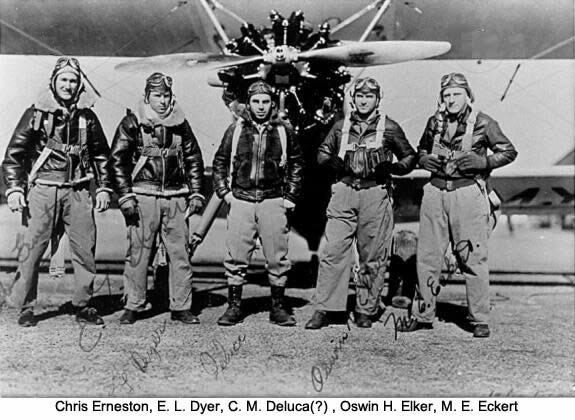 On his 23rd Mission his B-17 was shot up and several of the crew were wounded. They had to bail out. He was a P.O.W. for 15 months. After the war he was with the Westinghouse Electric Co. in Pittsburgh. Click here to read his interesting letter (a PDF). Click here for his picture at Douglas and here for a group picture. From his obituary: At the age of 17 enrolled in the Army Air Corps, the day after the attack on Pearl Harbor. 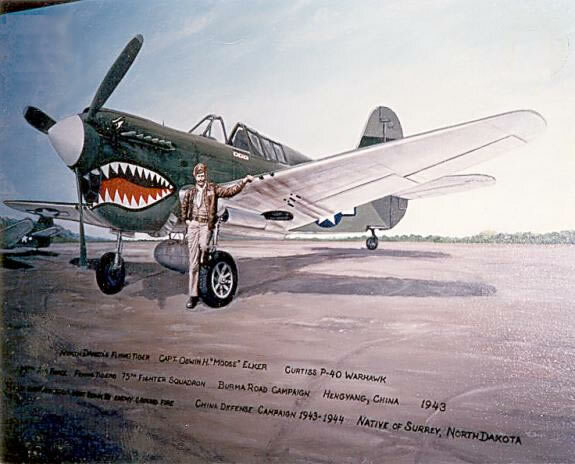 James served as an instructor pilot in P-40s and P-51s during World War II. He bravely returned to battle during the Korean War as Squadron Commander of more than 50 night missions in F-84s and F-86s. He retired from the Air Force Reserves as a Lieutenant Colonel. Born 21 Dec 1923. Of Hookstown, PA. Died Aug. 8, 2009. S/N: 13059860. He was a crew member of a B-29 assigned to the 40th Bomb Group flying missions the Central Pacific. Bill Bright was his Instructor at Douglas. He broke both ear drums and was washed out and became a Navigator. 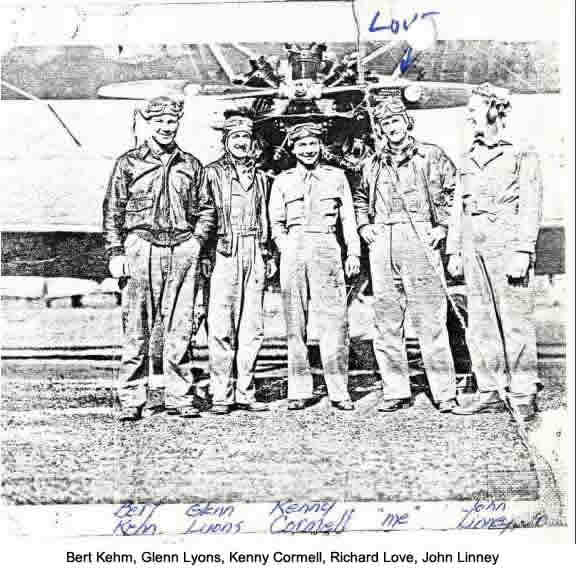 He graduated at Selman Field with the Class of 43-17 on December 23, 1943, S/N: O-703888. He was an B-24 navigator assigned to the 461st Bomb Group 766th Bomb Sqdn flying missions from Italy into Southern Europe. After the war he was in the motion picture industry in Hollywood. He washed out at Douglas. Enlisted 29 Mar 1942 in Pittsburgh. Graduated from Blytheville Army Airfield, Arkansas. He was an B-24 pilot assigned to the 467th Bomb Group 788th Bomb Sqdn flying missions from England after which he flew clandestine missions in B-24s into Europe at night with the 801st Bomb Group (Provisional). He was an B-17 navigator assigned to the 385th Bomb Group 549th Bomb Sqdn flying missions from England. He graduated at Selman Field with the Class of 43-10 on July 24, 1943. From Galveston Daily News Texas 1943-09-12: A B-17 bomber was believed to have lost its position in a formation in the Gulf of Mexico during a routine training flight. In attempting to maneuver back it collided with another ship. One plane exploded and both sank immediately afterwards. All 22 crew members were killed. Graduated at Blytheville Army Airfield, Arkansas, S/N: O-802710. He was an B-17 co-pilot assigned to the 306th Bomb Group 368th Bomb Sqdn flying missions from England. On January 11, 1944 he was co-pilot of B-17F (S/N: 42-30782) on a mission to Halberstadt, Germany when it was shot down by enemy aircraft. He attempted to bail out but it is believed his chute did not open after it got caught on the bomb bay doors. He was killed in action (MACR #1931). John Bassee was his principal instructor at Douglas. He had Basic at Greenwood and graduated from Craig Field. After graduation he flew P-40’s & P-51’s. He was sent to China where he flew 30 missions with the 76th Fighter Sqdn. 23rd Fighter Group, 14th Air Force (the Flying Tigers). He was discharged as a Capt. in May 1946. Click here for a group picture and another group picture in China. He graduated at Blytheville AAFd with the Class of 43D, S/N: O-802712. He was an B-17 pilot assigned to the 100th Bomb Group 351st Bomb Sqdn flying missions from England and became a POW on October 10, 1943. (MACR #1027) He was a prisoner at Sagan and at Moosburg. He had Basic at Greenville and graduated from Napier Field. He became a Major in the A. F. in 1952 and was made a Lt. Col. in the Reserves. He became an Episcopal Priest. He graduated (S/N: O-804996) and was flying a P-51 B-10 in the 8th AF, 352nd Fighter Group, 486th Ftr Sqdn over Europe. He was shot down on June 10 1944 somewhere near La Mailleraye, France after he and his squadron had just strafed a group of trucks (MACR # 5552). He graduated with the Class of 43D, S/N: O-802827. 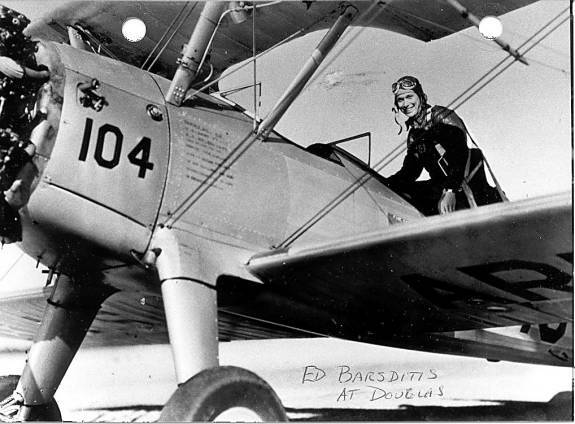 He was an instructor pilot stationed at George Field, Indiana where he taught cadets to fly two-engined aircraft. He then became a B-29 airplane commander of Crew #22 flying his missions over the final two months of the war with the 468th Bomb Group, 793rd Bomb Squadron based at the West Field on the island of Tinian. His home was in Northern New Jersey. He was in the 48th Fighter Squadron, which flew P-38’s. Volunteering to stay on after his 50 missions, he was lost on his 74th mission. Click here for more information. Caeser Miles was his Instructor at Douglas. He graduated and then flew fighters. He was also in the Korean war and in Vietnam. He flew 72 combat missions and won the D.F.C., Bronze Star, Meritorious Service Medal and 10 combat stars. He also flew Air Force One from 1963 to 1968 (Lyndon Johnson’s presidency). Afterward he was a tax collector in West Palm Beach. of West Palm Beach, FL. He died Sept. 6, 1991. He graduated at George Field with the Class of 43D, S/N: O-802833. He was an B-17 pilot assigned to the 91st Bomb Group 401st Bomb Sqdn flying 18 missions from England and was killed in action on March 6, 1943. His plane was attacked by enemy fighters and all bailed out except the ball turret gunner. He bailed out but did not survive, either being badly injured before bailing out or by getting killed by civilians on the ground near Gardelegen, Germany (MACR #2899). Graduated from Blytheville Army Airfield, Arkansas, S/N: O-802731. He was an B-17 pilot assigned to the 401st Bomb Group 615th Bomb Sqdn flying missions from England. 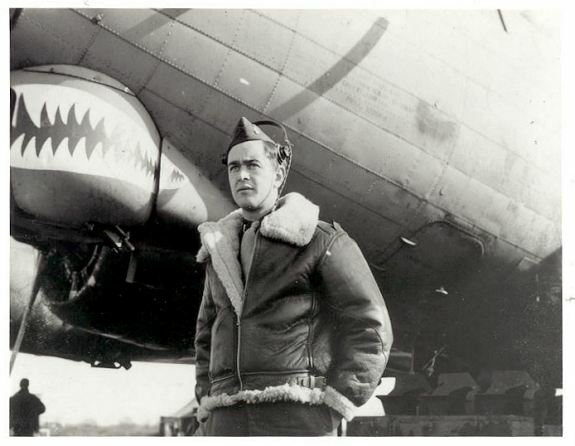 On April 9, 1944 he was pilot of B-17G (S/N: 42-38162) on a mission to Marianburg, Germany. On the return trip his plane was attacked by enemy aircraft, blowing the nose off the plane. The plane crashed into the sea and all 10 members of the crew were killed. (MACR #3940). Caeser Miles was his Instructor. He went to Basic at Greenville Army Air Base in Greenville, SC. He spun in on an approach, but survived it. He was unable to continue his flight training because of a steel plate in his head. Carmel lived in Covington until his death in 1981. Washed out, probably at Douglas. S/N: T-131968, O-936239. Enlisted June 18, 1940. 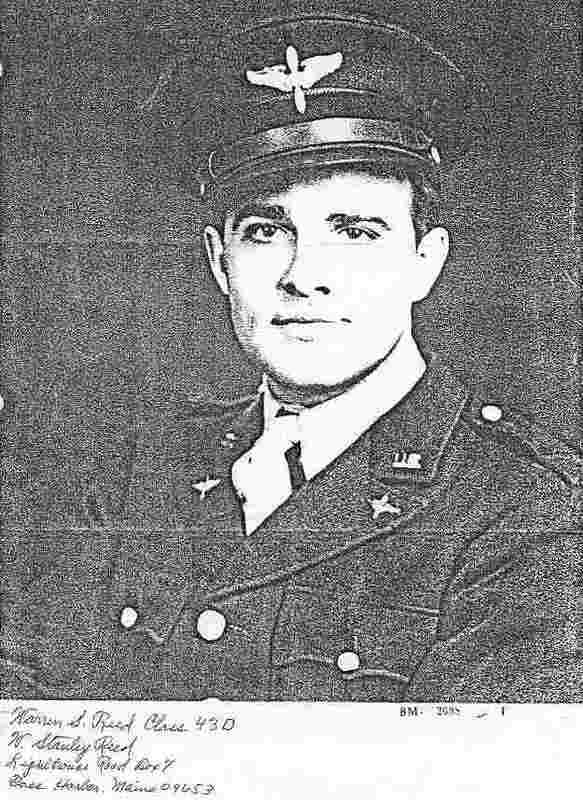 Per his obituary and other sources, he became an Army Air Force mechanic and later graduated as a pilot from a Central Flying Command pilot school with the Class of 1944-G on August 4, 1944. He stayed in the U.S. until Mar. 4, 1945, when he was sent overseas, presumably as a pilot, until July 23, 1945. (Locations and dates are per his Application for World War II Compensation). Per his obituary and a DFC citation, he also flew combat missions during the Korean Conflict and received the DFC for his work as an Electronic Countermeasures (ECM) observer on flights from Aug 15, 1952 to Jan 20, 1953. He retired as a 1st Lieutenant after 17 years of service to his country. He was released from service 20 Aug 1953. Buried North Point Cemetery, North Point, Pa.
Enlisted 30 Mar 1942 in Boston. He was an B-17 co-pilot assigned to the 482nd Bomb Group 813th Bomb Sqdn flying missions from England and SURVIVED a crash landing of B-17G (S/N: 42-97595) at base on March 17, 1944. Caeser Miles was his instructor. He graduated from Blytheville Army Airfield, Arkansas, S/N: O-802733. He was an C-47 pilot assigned to the 434th Troop Carrier Group 074th TCS flying missions in Europe. http://digicom.bpl.lib.me.us/cgi/viewcontent.cgi?article=1129&context=ww_reg_his (he is pictured on numerous pages – do a “find” (Ctrl-F) on “Eckert”). Caeser Miles was his instructor. He had Basic at Greenville and graduated Craig Field near Selma, Ala. S/N: O-802273. He went into P-40’s and was sent to India. Then to the 75th Fighter Sqdn., 23 Grp. 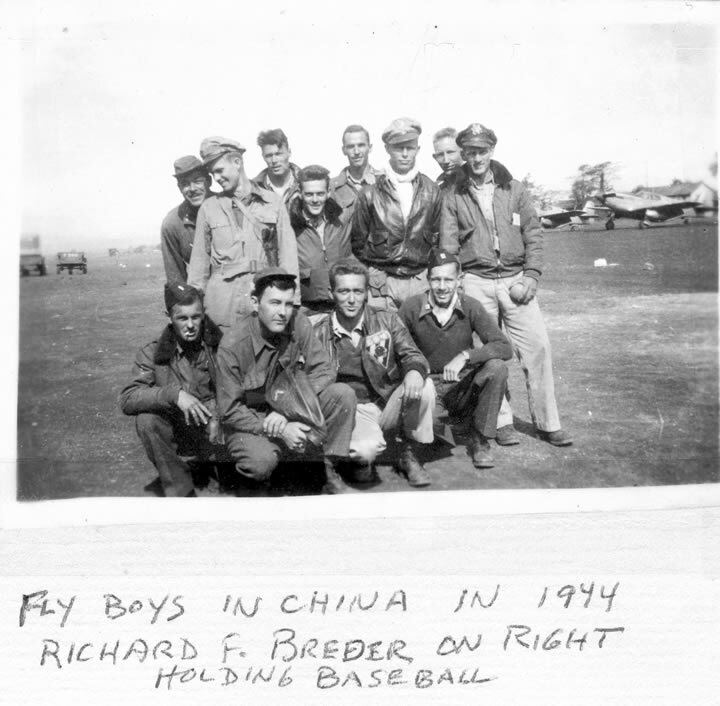 14th Air Force (the Flying Tigers) in China. He was shot down on 7-29-44 but walked out. Click here to read his entertaining letter (a PDF). He evaded capture. (See also MACR #7116: http://www.fold3.com/document/28712502/). Caeser Miles was his Instructor. He was a friend of “Moose” Elker. He graduated with class 43-D at Randolph. He was an instrument pilot instructor assigned to Cortland AAFd Basic Flying School in Alabama. He received specialized training for this duty at Randolph Field and Bryan AAFd both located in Texas. Click here for a photo. Of West Palm Beach FL. He was killed in action. No further information. 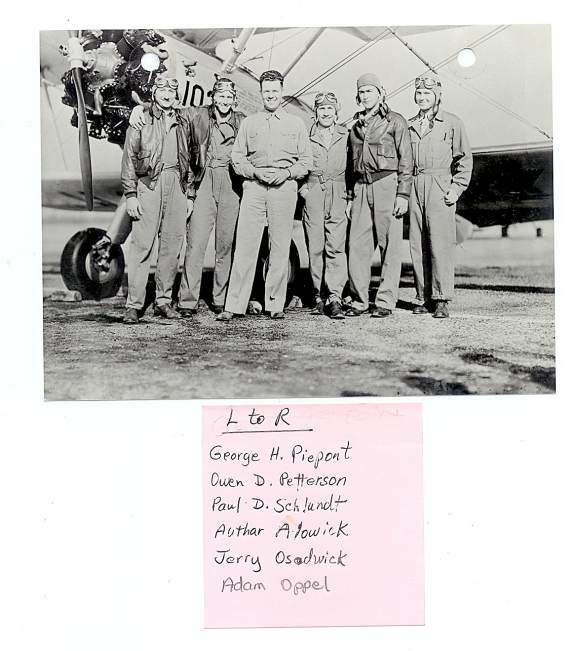 Lloyd Treadaway was his instructor. S/N: O-577649. He graduated at the AAF Officers Candidate School located at Miami Beach, FL with the Class of 43C learning the military administration skills. He wrote a book in 1966 about handling military funds and retired a Lt Col.
Lloyd Treadaway was his Instructor. He had Basic at Greenville and graduated at Craig Field, O-802281. He went to the Central Instructors School at Randolph Field, and then to the Central Instructors Instrument School at Bryan, TX. Then he was an instructor of BT-13A’s and AT-6’s at the Courtland, Ala. Basic Flying School for 16 months. He volunteered for B-29’s and was in a replacement pool when the war ended. He later returned to active duty. Lloyd Treadaway was his instructor. He graduated from Craig Field. He was a P-47 pilot assigned to the 404th Fighter Group 507th Fighter Sqdn flying missions in Europe. Then became an Aircraft Mechanic. He moved to Dayton, OH. area in 1947 where he worked for the Federal Gas Co. Graduated from Blytheville Army Airfield, Arkansas, S/N: O-802739. He was a B-17 pilot assigned to the 385th Bomb Group 549th Bomb Sqdn flying missions in Europe. http://forum.armyairforces.com/Bomber-crash-at-the-Volkswagen-factory-m165181-p2.aspx. On Mar. 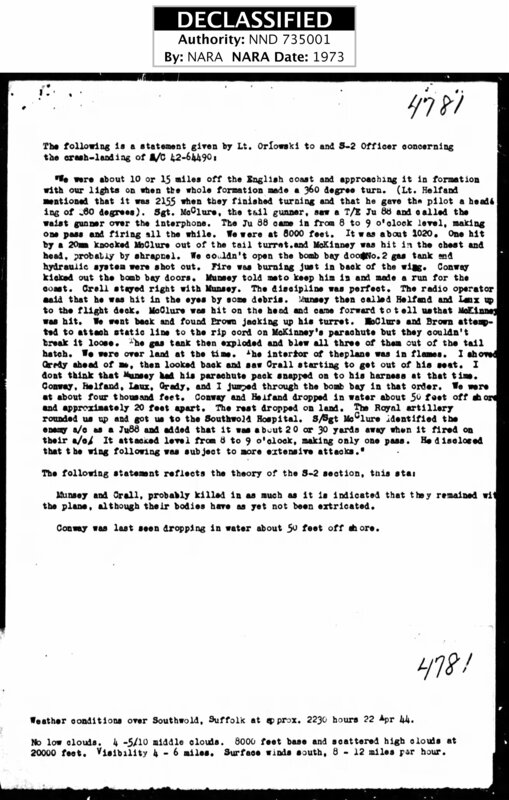 14, 1944 he flew and was witness to a B-17 shot down by fighters on a mission to Augsburg, Germany (MACR #3247). He graduated from Craig Field. Later he was instructing at Courtland, Ala. where he spun in (and was killed) with a student in 1944. Information from Aubrey Gaskins who was also instructing there. Homer made Capt. in the Reserve. He was a pilot for Airlift, Inc. Graduated from Craig Field, O-802387. Then instructed. Later went to B-29 Flight Engineering program. Eventually he was in the Texas Air National Guard. Holland washed out in Basic at Gunter Field. He graduated as a bombardier with the Class of 43-12 at Midland AAFd on August 26, 1943. He was B-24 bombardier assigned to the 459th Bomb Group 757th Bomb Sqdn flying missions in Southern Europe. He flew 52 missions with the 459th Bomb Group. See http://www.459bg.org/Holland_Hessel_H9155_459BG.cfm – he was awarded the Air Medal with 3 oak leaf clusters. After the war he went to Georgia Tech. Then had a career as a Manufacturer’s Representative. Of MA, later of Atlanta, GA.
Enlisted 26 Aug 1940. S/N: O-802753. Served until 31 Jul 1965. Enlisted 23 Apr 1941. Washed out in Basic at Gunter. Became a 2nd Lt.
Born 07 Nov 1916. Died Aug. 19, 2000 Utica, NY. Johnson, R. M. (Max?) Jr.
S/N: O-803018. He was a P-38 pilot assigned to the 347th Fighter Group 68th Fighter Sqdn flying missions in the South West Pacific Area. On Nov. 22, 1944 on a mission to Makassar Strait, his plane was hit and he belly landed. He got out of the plane onto a life raft. The Japanese were nearby and probably took him prisoner or killed him, as search planes could not find him later (MACR #11035). Distinguished Flying Cross, Air Medal with 9 Oak Leaf Clusters, per American Battle Monuments Commission. From PA (please note that several websites have an incorrect date of death). Landrum, Charles or Clyde W.
He graduated from Blytheville Army Airfield, Arkansas. If the same person, he may have received the DFC, the Air Medal with 3 oak clusters, and Presidential unit citation, as a 1st Lt. at age 24 on Sept 5, 1944 (per U.S. WWII Jewish Servicemen Cards, 1942-1947). S/N: O-803027. He graduated with the Class of 43D and had possibly been reassigned to Napier Field, as an instructor pilot. On May 20, 1943, he was flying an AT-6C (S/N: 42-49024) out of Napier Field and was killed near Hyman Field, Ala. after crashing his plane into the ground. His instructor was Kenny Cormell. He had Basic at Montgomery, Ala, and Advanced at Dothan, Ala. He went to the Pacific and flew P-39’s and P-38 “Lightnings.” He served 18 months followed by another tour of 6 months in the Pacific and was Commander of the 68th Fighter Sqdn. “The Lightning Lancers”. He received the D.F.C, Soldier’s Medal, Bronze Star, Air Medal with 10 Oak Leaf Clusters, Presidential Unit Citation with one Oak Cluster, and other ribbons and citations. He graduated with the Class of 43E at George Field in Illinois, S/N: O-804363. He was a B-17 pilot assigned to the 452nd Bomb Group 728th Bomb Sqdn flying missions in Europe and was shot down on February 25, 1944. He bailed out over Saarbrücken, Germany, and became a POW. In February 1945 he was repatriated back to the U.S. and spent time in Walter Reed Hospital (MACR #2862) . Born April 25, 1921. From Onondaga County, NY. Washed out in Basic at Gunter. Enlisted 10 Feb 1942 at Ft. Devens, Mass. Washed out in Basic at Gunter. Served as a SSgt in the Army Air Forces. Born Jan 25 1917 in Massachusetts, died December 4, 2004. S/N: O-802770. He was a B-17 pilot assigned to the 2nd Bomb Group 96th Bomb Sqdn flying missions in Southern Europe. On December 14, 1943, he was co-pilot of B-17F (S/N: 42-5050) on a mission to the Eleusis, Greece aerodrome when his plane was hit by enemy fighters. He bailed out and became a POW (MACR #1482). Believed to be in the Chicago, Ill. area. Salesman there about 1960. He was a ferrying pilot assigned to the 7th Ferrying Group based at Gore Field located near Great Falls, Montana and primarily flew P-39s and B-25s to Alaska. He graduated with the Class of 43D at Napier Field, S/N: O-803035. He was a transport pilot assigned to the Air Transport Command based in India and flying supplies over the southern edge of the Himalayan Mountains into China. S/N: O-803039. He was B-24 pilot assigned to the 392nd Bomb Group 579th Bomb Sqdn flying missions in Southern Europe. Click here for a picture of his crew. On Mar. 29, 1943, he was flying an AT-6C out of Marianna, FL and was killed when his plane crashed into the ground 12 miles west of Georgiana, AL. Charles Culbertson was his instructor at Douglas. He graduated S/N: O-801898 and served in the A.T.C. ferrying aircraft in Africa and Italy. He stayed in the A.F. for a 22 year career. After that he flew for Pacific Southwest Airlines. He retired with about 29,500 hours flown. Started Oct. 23, 1942. Paul Schlundt was his instructor. He washed out at Douglas. He served as a sergeant. Paul Schlundt was his Instructor at Douglas. He graduated as a bombardier with the Class of 43-11 at Midland AAFd on August 5, 1943. He was a B-24 navigator/bombardier assigned to the 453rd Bomb Group 753rd Bomb Sqdn flying missions from England. He flew 32 missions. On his 17th mission on April 22, 1944 he was injured when his plane was attacked by a Ju 88 near the English coastline as they were on their way back to the base. Click here for his account of the attack. (MACR #4781). He instructed for a year on return to the U.S.A. As a civilian he was a Tool Engineer. Paul Schlundt was his Instructor. He was at Basic at Gunter and Advanced at Columbus, Miss. S/N: O-802776. He was a 1st pilot on B-17’s at Sebring and later at Pyote, TX. Also bombing training at Dalhart, Tx. 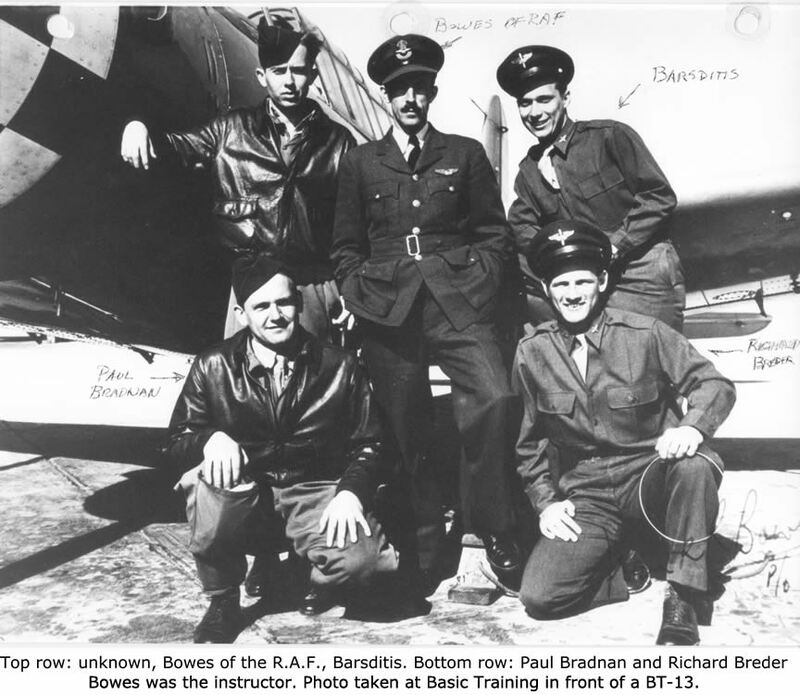 Then he was sent to England in the 13th Combat Wing, 569th Bomb Sqdn. 390th Bomb Group and had 20 missions. He was also in the 93rd Bomb Sqdn, 390th Bomb Group. On D-Day + 6 days, he was landed in France to transport urgently needed supplies into France and transport wounded, prisoners, VIPs, etc. out. He did that for 6 months. From IL, later of New Canaan, Conn.
Paul Schlundt was his Instructor. He went to Gunter for Basic and graduated from Advanced at Dothan, AL. Next he volunteered as an Instructor at Tuskegee, Ala. He stayed there for 2 1/2 years teaching Basic & Advanced in AT-6’s. He was made Capt. just before being discharged. Wife: Valaree Petterson – he married Valaree on Apr 29, 1943, just 2 days prior to graduation. 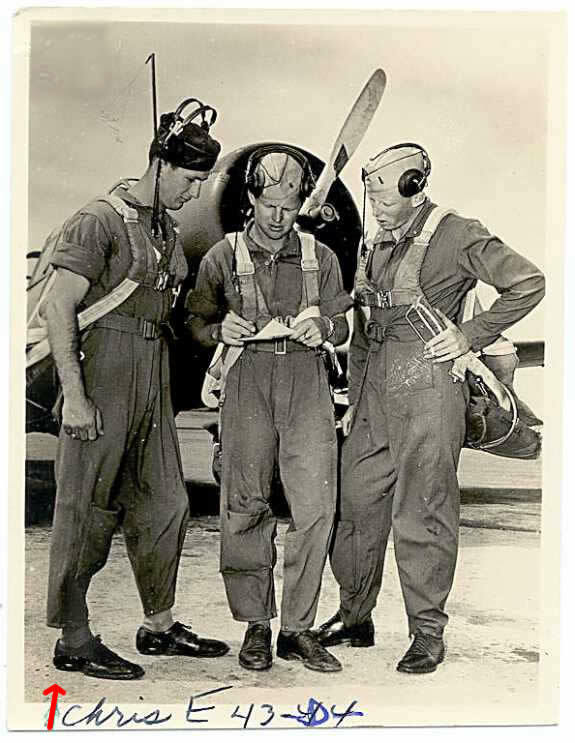 He was from Salem, Va.
Robert and his Instructor James Puryear, were killed while practicing forced landings. Avn Cadet killed November 19, 1942. He was from Lancaster, Pa. He graduated with the Class of 43E at George Field in Illinois, S/N: O-804395. He was a B-17 pilot assigned to the 381st Bomb Group 535th Bomb Sqdn flying missions in Europe. Puryear and Allen Cadle were his instructors. He had Basic at Gunter Field. In Feb. 1944 he was shot down over Germany. He had a 23 year career with the Air Force. He retired from active duty in 1960. Click here for more information. Dudley Reed was his instructor. He had Basic at Gunter and graduated from Blytheville. He was in England with the 8th Air Force, 306th Bomb Grp. 368th Bomb Sqdn. flying B-17’s. He had a 32 year career with the Air Force. Click here to read his letter (a PDF). On April 24, 1943, he was flying an AT-6C (S/N: 42-48927) out of Napier Field, AL, when he ground looped a plane on his takeoff roll. He served in World War II, Korea and Vietnam. He went on to become a Lt Col.
George Kalec was his Instructor. He had Basic at Greenwood, Advanced at Napier. Later he was with the 1st Air Transport Sqdn. Next he was in the C.B.I. Theatre and flew C-46’s over the “Hump.” Afterward he joined the Reserve and retired from it as a Major. Jim Puryear was his Instructor. Gilbert went with Robert Post’s body to Lancaster, Pa. after Post and Puryear were killed at Douglas. When he returned, he refused to fly (at his Mother’s request) so washed himself out. Washed at Douglas. He was seen at Ridgewood Air Station as a Ground Support man. Herb graduated as a 2nd Lt. at Napier Field. 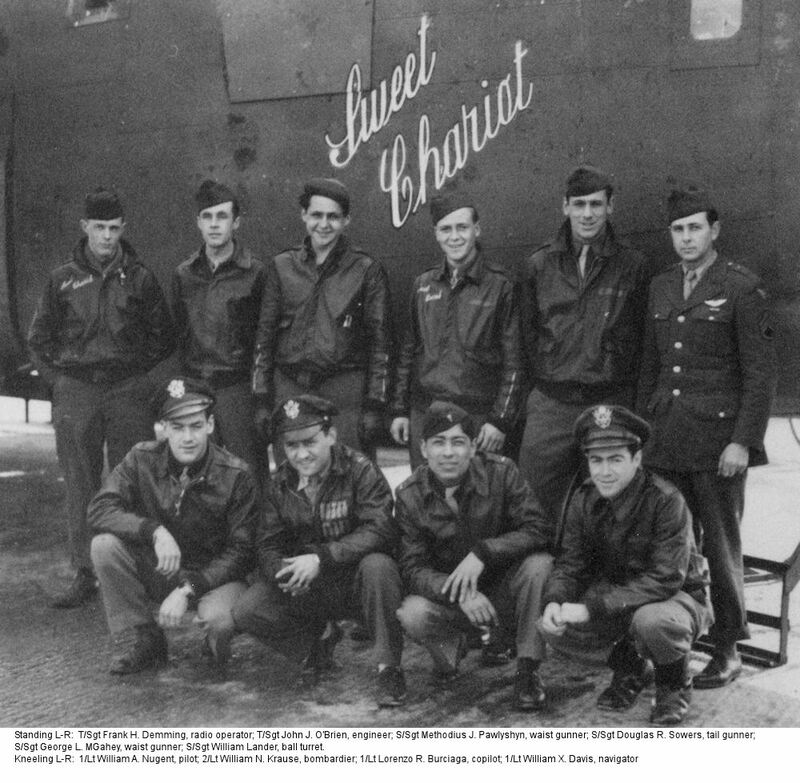 He became an instructor in BT-13’s at several locations in the U.S. He took P-51 training Aug. 1945. He then became a salesman and was active in the Reserves at Scott Field, IL. thru 1951. He went to Korea in Feb. 1953. From 1954 through Aug. 1971 he had a number of assignments around the U.S. He was a Student officer at Douglas. He had Basic at Greenwood, MS. and graduated from Blytheville Army Airfield, Arkansas. He became a B-17 pilot. He served in the 384th Bomb Grp., 547th Sqdn. in 1943 & 1944. He was Killed in Action Feb. 22, 1944. He is buried in the Ardennes American Cemetery at Liege, Belgium. Click here for more information. He graduated from Blytheville Army Airfield, Arkansas. He was active in the Air Force Association (AFA) Unit #239 in Washington, and the chapter was renamed Donald W. Steele, Sr. Memorial Chapter of Northern Virginia, #239 in his memory in 1980. S/N: O-803066. He was a transport pilot assigned to the Air Transport Command based at Chabua India and flying supplies over the southern edge of the Himalayan Mountains into China. He was discharged at the end of the war. He returned to the service 2 years later and retired as a Lt. Colonel in 1969. S/N: 17028598. He served at Chanute Field in the personnel service branch and died December 13, 1956. 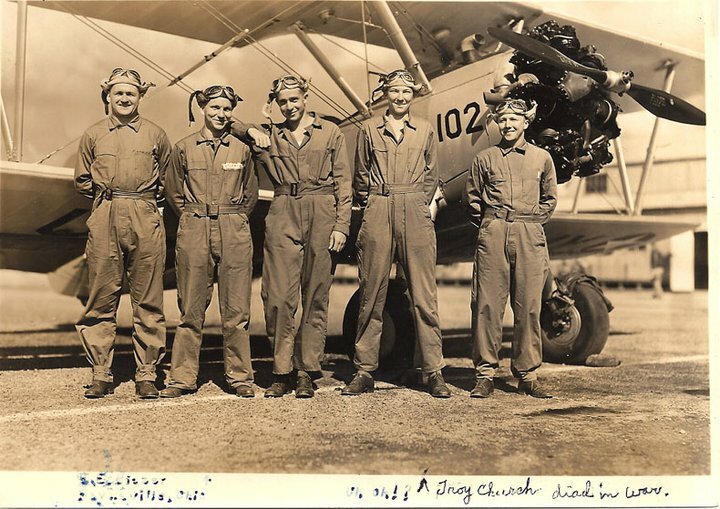 Emil graduated and was in the Air Transport Command flying to Africa and back. He was awarded the Air Medal and Purple Heart. J.B. Knox was his instructor. He graduated from Blytheville Army Airfield, Arkansas. He was a bomber pilot assigned to Langley Field in Virginia, where he flew training missions for radar operators out over the Atlantic Ocean. He graduated from Blytheville Army Airfield, Arkansas. He was a ferrying pilot assigned to Homestead Army Air Field for training with the 20th Operational Training Unit of the ATC. He graduated from Blytheville Army Airfield, Arkansas, S/N: O-802822. He was B-17 pilot assigned to the 370th Bomb Group 526th Bomb Sqdn flying missions in Europe. 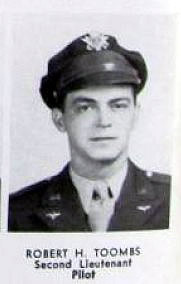 On March 26, 1944 he was a co-pilot on a B-17 that was shot down by anti aircraft fire. He bailed out and became a POW and was imprisoned at Barth Germany (MACR #3592). Lived in a Chicago suburb after WWII.